This week, Apple unveiled a raft of new services and features at Monday night’s event in the Steve Jobs Theatre in California. The biggest announcement was undoubtedly Apple TV+ — the company’s first foray into video streaming. This new paid, ad-free TV portal will launch in the fall and will feature Apple’s own original content. So far the company has two docu-series from Oprah lined up, as well as celebrity-filled drama series ‘The Morning Show’. Apple also announced that it was partnering with Goldman Sachs to release its own credit card this summer. In what CEO Tim Cook called “the most significant change in the credit card experience in 50 years”, the Apple Card will be available on all iOS devices in the Wallet app. The final big release of the night was the new gaming service, Apple Arcade, a subscription service planned for the fall that will allow users access to over 100 exclusive games. All in all, the announcements on Monday night signal the company’s shift towards the high-margin services business. Though Apple might appear to be playing catch-up with the likes of Amazon and Netflix in some areas, the $245 billion sitting in its coffers will definitely help speed things up. European Union lawmakers approved major copyright reforms on Tuesday that have pitted large technology companies such as Facebook and Google against artists, journalists, and media firms. The ruling, which was backed in the European Parliament by 348 votes to 274, will force online services and social networks to pay publishers for use of news snippets and other content. In essence, these new rules mean that Google, Facebook, and other platforms will be made to sign licensing agreements with artists and journalists to use their work. Google-owned YouTube and Facebook-owned Instagram will also need to install filters to obstruct users from uploading copyrighted content. The directive has proved highly controversial, with digital pioneers such as Tim Berners-Lee and Wikipedia founder Jimmy Wales expressing concern about its potential to stifle creativity, while ex-Beatle Paul McCartney has argued in favour of the changes. Meanwhile, as many as 200,000 thousand people have taken to the streets to voice their opposition to what is seen as a draconian reform that will overturn the very principles of freedom and self-expression that has made the Web a central part of billions of lives. Infamous attorney Michael Avenatti was charged by federal prosecutors this week for allegedly trying to extort Nike for more than $20 million. In a bizarre turn of events, Avenatti was arrested in Manhattan on Monday afternoon off the back of a criminal complaint that accused him of threatening to release allegations of misconduct against Nike employees the day before the company’s earnings call. In the complaint, it is claimed that Avenatti threatened to disclose these allegations at a press conference unless Nike made millions of dollars in payments to him and an unnamed co-conspirator by hiring them to conduct an “internal investigation”. Shortly before he was arrested, Avenatti had tweeted that he would be holding a press conference to discuss “a major high school/college basketball scandal perpetrated by Nike that we have uncovered.” In a statement, Nike has since said it would “not be extorted or hide information that is relevant to a government investigation” and had been cooperating with an investigation into NCAA basketball for over a year. Icelandic budget carrier Wow Air shocked passengers yesterday when it announced that it had ceased operations and cancelled all its flights. Once a darling in the world of low-fare airlines, Wow Air — which offered mega-cheap flights between North America and Europe — nevertheless racked up some serious losses over the years. Indeed, the company spent the latter part of 2018 scrambling for funding from venture capital firms and airlines, including its main rival, Icelandair. As potential investors walked away one by one, Wow Air was effectively running on empty by the end of this week. The financial pressure proved too much, and on Thursday morning, thousands of passengers found themselves stranded on both sides of the Atlantic with plane tickets not worth the paper they were printed on. Meanwhile, CEO Skuli Mogensen sent a letter to employees expressing genuine pain and remorse: “I will never forgive myself for not acting sooner. Wow was clearly an incredible airline and we were on the path to do amazing things again.” As a result, Wow Air now joins its fellow failed carriers, Flybmi and Monarch, in the rapidly expanding airline graveyard. As Slack prepares for its highly anticipated IPO this year, the hugely popular professional communications app is facing backlash from some executives whose employees use the service. Speaking to the press, a number of high-profile Slack clients expressed concern about the technology’s security — and about their own employees’ abilities to remain sensible when using it. “I love my people, but they never shut up on Slack,” said one anonymous CEO. “It’s very good for productivity, but the problem is we’re working on security, so we have to be careful about what we say.” Another executive, BetterCloud CEO David Politis, revealed that in a recent survey conducted by his company, 75% said that threats from office collaboration tools like Slack were a top security priority. And while Slack can always work on building up its encryption mechanism in the future, gaining a reputation for poor security could be detrimental to the company, even if it’s mostly the fault of overly-chatty employees. No matter how heavily you invest in a platform, it can always be undermined by good old human gossip and carelessness. is the current market value of notoriously frugal billionaire Warren Buffett’s cell phone. was the opening price per share for the IPO of ride-hailing company Lyft, valuing the company at well over $20 billion. is how much a typo-ridden first-edition copy of JK Rowling’s first novel, Harry Potter and the Philosopher’s Stone, sold for this week. 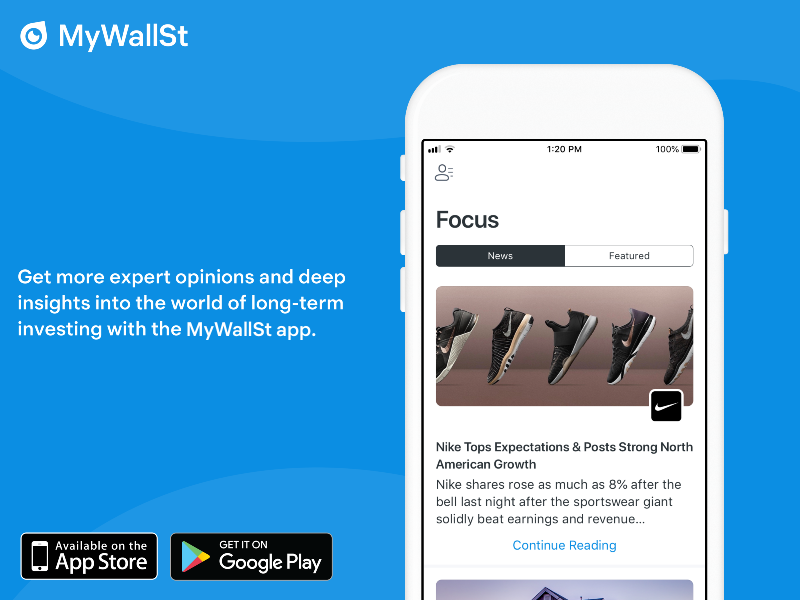 Want to experience the best investing app around? Download the Invest app for Android or iOS now! MyWallSt operates a full disclosure policy. MyWallSt staff may hold long positions in some of the companies mentioned above. Investing is for everyone, we show you how. MyWallSt is a multi-award winning company that helps you to become a confident and successful investor.